Sometimes warning signs can be ignored, but not when it comes to a giant, man-eating alligator in the local swimming hole. A gator believed to be responsible for the attack, measuring more than 11 feet long, was shot and killed over the weekend. 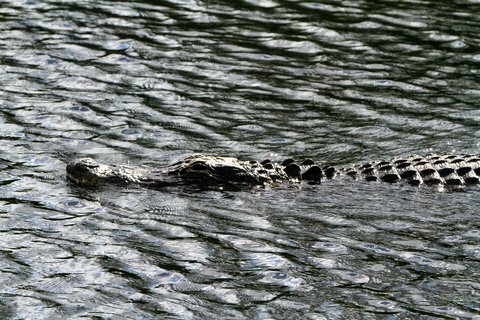 Michelle Wright, an employee at Burkarts Marina near the Louisiana state line, told the local KFDM television station she had warned the young man about the gater when Woodward responded with the expletive and jumped into the water. Those would be his final words as he was attacked almost instantly. “I asked him please do not go swimming, there’s a bigger alligator out here, just please stay out of the water,” Wright said. “The next thing I know this girl is screaming, an alligator’s got him,” Wright said. Almost immediately upon hitting the water he was dragged under, Wright said. A few minutes later he surfaced floating face down. Then he was dragged under again and pulled off. The man’s body was discovered a few hours later. previous articleAre Fishermen Causing a Spate of Shark Attacks?